Here's an early sneak peek at the Audi A7 Sportback, the newest member of the Auto Union's aluminum und shteel Bundeswehr, showing off its big back end ahead of tomorrow's official unveiling. The A7 Sportback should be available with Audi's quattro all-wheel drive system and both diesel and gas V6 engines — including the new 3.0-liter TSI powerplant. Also expect to see a performance-oriented S7 and RS7 variant to hit the lineup within the next year. 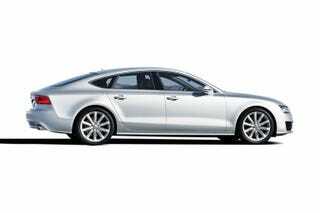 The A7 Sportback will shimmy its extended rear end in between the A6 and A8 in Audi's executive sedan lineup. The A7 Sportback's expected competition will be other similarly large-assed executive sedans like the BMW 5-Series GT and the upcoming Mercedes-Benz CLS. Our initial impression is probably the same as yours when confronting any new entrant into the I-like-big-butts segment — why? We'll just leave it at that. More pictures below.